Walnuts - Juglans regia - are dicotyledons. They have two seed-leaves, and the nut reflects this in its shape, being bilaterally symmetrical. 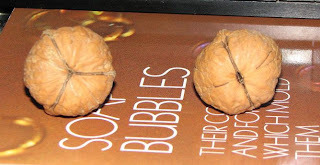 So I was surprised when eating my way through a bag of walnuts to find one that was trilaterally symmetrical. Does this mean that this mutation would be a tricotyledon? It wasn't just shell features: the interior nutmeat followed the three-lobed plan. So how common is this mutation?